The group began the night with “Rosario,” ushered in by the cello’s low throaty pitch, reflective of a folksy, somewhat spiritual sounding church prelude. It is inspired by a Catholic Holy Rosary, traditionally played on folk instruments at funerals or other occasions. It is immediately interrupted with soulful, virtuosic alto saxophone lines. It beautifully juxtaposed 200-year-old classical music traditions and rule-bending modern jazz influences. Miguel Zenón and Spektral Quartet dove deep inside the musical/cultural history of Puerto Rico, but also looked towards Western music to uncover the wisdom behind the tradition. 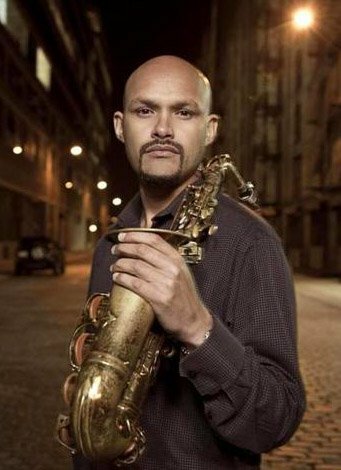 Tradition is, after all, nothing more than a “corpse of wisdom.” Miguel naturally challenges it with his exceedingly outgoing personality, extending it with his rich musical vocabulary of contemporary jazz. What is the point of a set-in-stone (musical) tradition if the wisdom behind it is not present anymore? It truly is a brave composition that connects The Catholic Church representing Holy Rosary’s musicalized order with a refreshing impressionistic texture, jagged rhythms, syncopated phrases and intense vibrancy that shines through Spektral’s musical delivery. Cadenas demands a dance-like execution for this eight-piece composition. The violin first moves our hips with chipper, playful lines, before more dissonant accompaniments lead to a fervent saxophone solo. Perfectly coordinated sudden changes of direction with chiffon-like strings’ textures recalls audience to instantly think of Debussy and Ravel. Fiery, stirring alto saxophone solos come to us in a classical music style. Viejo, being my favorite – echoes a harmonic cadence from medieval times, beautifully varied by string players before launching into a soulful cello melody. Miguel chimes in with solo improvisations encompassing and lifting the tune to new heights. It’s close to transcendent. Written in the style of “Aguinaldo Viejo” it is believed to be the oldest example of the “Jibaro” tradition. Promesa, number 7 on the album, is the most spiritual. In many cultures, this number is considered a sacred one that refers to wisdom or divine perfection. After listening to very meticulous compositions with complicated rhythms that came before, I enjoyed how it soothes the soul and celebrates the Three Kings of Christian tradition otherwise known as “El Día de los Reyes” (observed on January 6th). Its repeated notes channel the inner feeling of safe space followed by Miguel’s heart-touching yet beautifully syncopated alto saxophone on top of Spektral’s solid Bartok-like musical canvas. “Yo soy la tradiciòn,” reminding one of Kronos Quartet albums, encompassed varied styles and atmospheres and bent traditions; it can give listeners who weren’t at First Church last week a chance to enjoy an exceptional musical journey! Personnel: Miguel Zenón, alto saxophone; Spektral Quartet: Clara Lyon, Maeve Feinberg, violins; Doyle Armbrust, viola; Russell Rolen, cello.